Canon Sheehan was the first President of the Society on its foundation in 1891. He was appointed Roman Catholic Bishop of Lismore & Waterford on 15 January 1892 and consecrated on 31 January 1892. He retired as Society President in 1893. 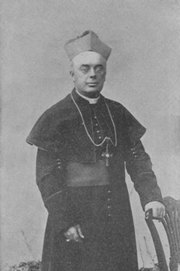 Bishop Sheehan died in office on 14 August 1915. Next Post Past President: 1894-1914 Robert Day, Jr.